Kotobukiya continues their lineup of Bishoujo Statues based on Super Heroes and Villains from the pages of Marvel Comics with Wasp ! Beware of Wasp's stings ! ・Based on a new character interpretation and illustration by master Japanese Illustrator Shunya Yamashita. ・Wasp lightly touches down on a special base designed to look like a splash of water. 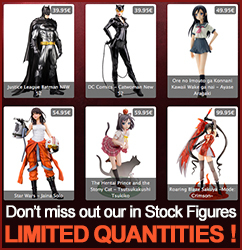 Display alone or alongside other Marvel character inspired Bishoujo statues from Kotobukiya !